Take a look at your diet. What does it mainly consist of? Do you consume a lot of meats and dairy products? If so, you probably have a pretty high level of acid in your blood – and that’s not really a good thing. It has been found that eating a highly acidic diet could increase your chances of kidney damage, liver damage and even increase your chances of diabetes. Fortunately, you can negate the negative effects of those highly acidic foods by consuming alkalizing foods, which will help to neutralize your body. What does it mean to alkalize your body? Well, put simply, there are two opposite sides of the spectrum: On one side is the alkaline side and the other is the acidic side. In the middle of the two is the neutral zone. The pH scale that is used to measure the acidity and alkalinity of a substance ranges between 0 and 14. A pH that is above 7 is considered highly alkalized, or basic, and a pH of less than 7 is considered highly acidic. If the pH is 7 on the dot, it is considered neutral. What does pH stand for? It means ‘potential of hydrogen,’ and it is the measurement of the electrical resistance between the negative and the positive ions in the body. 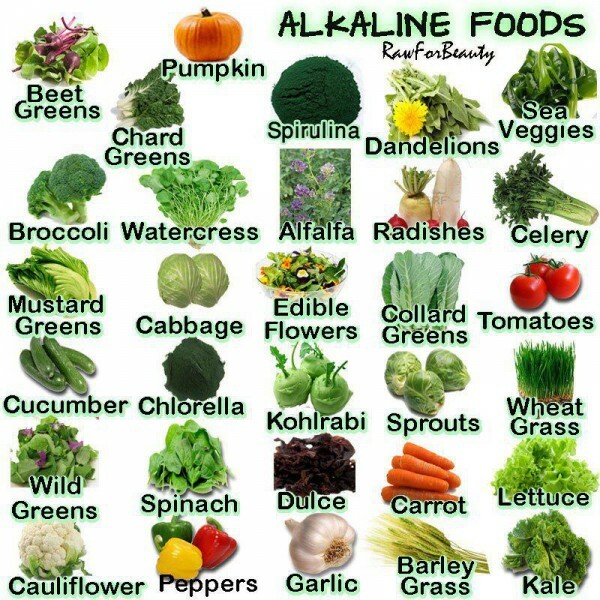 Specific areas of the body should be more acidic, such as the stomach, while others should be more alkaline. When the body is highly acidic, it starts to ‘borrow’ calcium, sodium, magnesium and potassium from the blood, the bones and the body’s vital organs in order to neutralize the acid, which helps to remove the acid from the body. So, what’s the benefit of alkalizing the body? Well, if your pH levels are too acidic, your body will start to pull from your bones and other vital tissues, which can inhibit its ability to repair itself, thus you will become more prone to illness and disease. What Should the pH of the Body Be? In order for the body to maintain the healthiest living environment possible, the pH should be between 7.36 and 7.44. If the pH falls between this range, the blood will be an effective medium for nutrients that are vital for the body, as well as oxygen. If the pH moves too far in either direction – too acidic or too alkaline – that’s when damaging effects start to happen. By adding more of these foods to your diet, not only will you create a more neutral environment for your body, but you’ll also gain a tremendous amount of beneficial vitamins and nutrients.